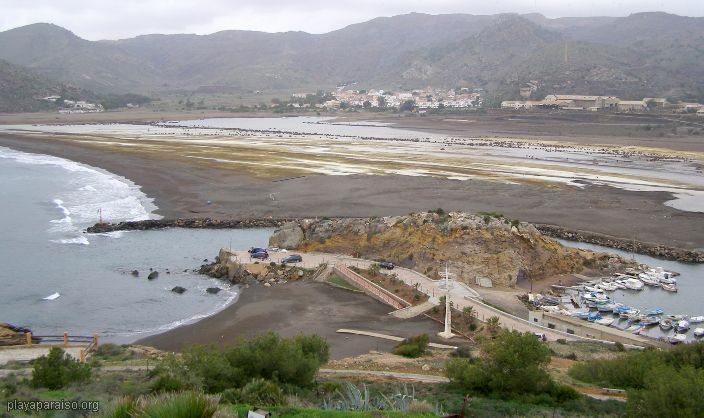 Portmán (the Roman Portus Magnus) is located on the Mediterranean coast, on the back road between La Manga Club and Cartagena, in the heart of the now abandoned mining area. Dating back from Roman times it has probably suffered from the worst pollution on the entire Mediterranean coast. The waste dumping from the mining areas has covered this beautiful bay and turned what used to be a flourishing fishermen's village into a small interior village. However, huge efforts are being made to restore the beach and the village is rapidly becoming one of the most desirable locations in the area. Although the only area of beach that is currently used (apart from a few hardy surfers who use the main beach) is small with black sand, it is very sheltered and there always seems to be an area which is a suntrap where you can enjoy the winter sun. The photo above shows the harbour, beach, walks and new promenade. Coming in from the direction of La Manga Club you reach this area by turning off left at the roundabout just before you reach the village. As you can see, the bay is sheltered by the surrounding hills and can be a lovely spot in which to catch the winter sun. The next photo shows the main beach restoration in progress.